208/230 Volt AC Input Compact Wire Welder The SP-180T can help you get it done for farm, light fabrication, auto or home projects. Just plug it into a 208 or 230 volt outlet in your garage, barn or shop. Superior Arc Performance - Forgiving arc and simple tapped voltage control make dialing in your application easy. Smooth arc starts with minimal spatter. 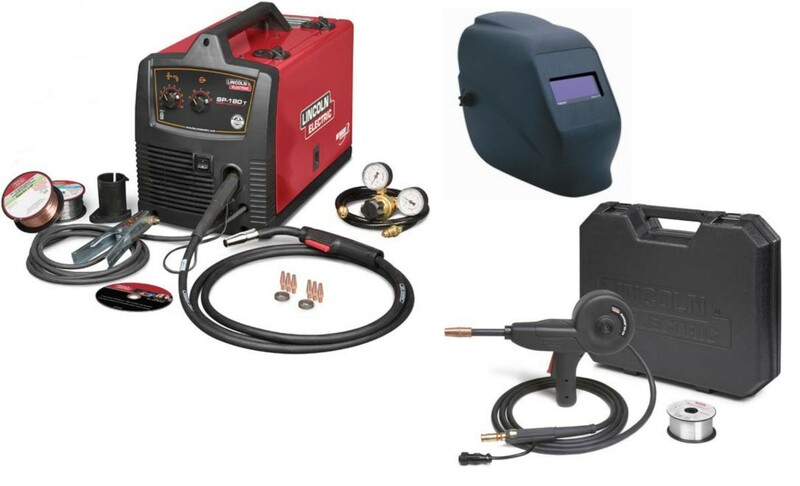 Wide 30-180 amp welding output range. Precise Wire Drive - Precision full adjustment drive system reduces chance of wire tangling and crushing. Brass-to-Brass gun connections for enhanced conductivity. Large industrial closed design drive motor for improved torque and trouble-free performance. Toughest PC Board Protection in the industry - `Potted` to seal sensitive components from the environment,`trayed` in a tough plastic tray to add rigidity and shock resistance. The Magnum 100SG spool gun is the lowest cost way to add reliable and precise wire feeding performance for soft aluminum wire. Its easy to set up for novice and experienced welders on Lincoln Electric compact wire feeder/welders. All aluminum alloys and recommended wire diameters can be fed with the same drive roll and liner assembly. Ergonomic grip and balanced design. Full travel mechanical trigger can be easily felt through a welding glove. 10 ft. (3.0 m) gun cable , control harness, and gun connector offers fast connections to the welding machine. No expensive gun or bulky adapter module is required. Cushioned carrying case protects the gun during transport and storage.